(1) Väinämöinen opens the poem. He is the son of the daughter of the air, and is born old and wise in the creation of the world; he is the mightiest singer in the world, and he settles in the land of Kalevala. His excellence as a singer leads a young singer, Joukahainen, to challenge him to a singing duel; Väinämöinen sings him into a swamp until Joukahainen, to save his life, promises Väinämöinen the hand of his sister, Aino. This does not turn out well; afraid to marry such an old man, Aino chooses to drown herself instead. Väinämöinen then sets out to ask for the hand of the Maid of the North, but on his way there he is attacked in revenge by Joukahainen and is lost until an eagle carries him to the Northlands, Pohjola. There he strikes a deal with Louhi, the Mistress of Pohjola, that if he can get Ilmarinen to make a marvelous mill, the Sampo, for her, then she will let him marry her daughter. Ilmarinen is the greatest smith; he had forged the very firmament itself. The Maid of the North is not quite so thrilled, and sets Väinämöinen all sorts of impossible tasks, which he completes; and then he convinces Ilmarinen to make the Sampo. However, he never gets the bride. This takes us to the tenth song. (2) We then get the story of lusty Lemminkäinen, who sets out to woo the beautiful maiden Kyllikki; which he does by kidnapping her. However, he becomes dissatisfied with her ways and abandons her to woo the Maid of the North. This venture is utterly ill-fated; he dies. However, he has a mother who loves him very much, and she goes to the Deathlands, Tuonela, to bring him -- and does. This requires actually putting him back together piece by piece. This gets us to the fifteenth song. (3) We then get quite an elaborate wedding cycle that begins pulling various strands together. Väinämöinen makes a boat, which he only manages to complete by going to Tuonela to get magic charms. He then heads off to Pohjola to win the Maid of the North, but Ilmarinen hears about it and sets out by sled to get there first. They get there about the same time, but given a choice between the old Väinämöinen and the handsome young Ilmarinen, the Maid of the North has no hesitation in choosing Ilmarinen, despite the fact that Louhi would rather she marry Väinämöinen, who is at least not a grimy smith. Ilmarinen completes the requisite impossible tasks, and then there are several songs devoted to the wedding. However, Lemminkäinen was not invited, and he tries to crash the wedding; which leads him to kill the Master of the Northlands, to the obvious fury of Louhi. He is forced to flee and hide on an island. Which he is again forced to flee due to the husbands of the wives he seduces. He finds that Pohjola has destroyed his home, and he sets out to have his revenge, but he can't even get there because Louhi captures his ships in ice. This takes us up to the thirtieth song. (4) We then get the story of Kullervo, Kalervo's son. Two brothers, Untamo and Kalervo, quarrel, which leads Untamo to kill Kalervo. Kalervo has a son, however, Kullervo, who lives in Untamo's house for a while. One of the things that's important to grasp about Kullervo is that he is quite literally larger than life: and, as one might expect of a real larger-than-life person let loose on the world, he destroys everything around him. Set to the task of making a clearing in the woods, he levels the forest, including the good timberland. Set to the task of beating wheat to separate grain from chaff, he beats both grain and chaff into dust. Untamo sells the boy to Ilmarinen, whose wife dislikes Kullervo for some reason and mistreats him every chance she can get. At one point, making him a meal for taking the cows out to pasture, she deliberately bakes a stone into his bread out of malice. In response, Kullervo, as unrestrained as ever, brings home a pack of wolves and bears instead of the cows. When she goes out to milk the cows, she is attacked; she begs Kullervo for help, but he refuses and she dies. Kullervo flees back to his family, where he discovers that his sister has vanished. Later, on a trip for the family, he comes across a woman, whom he seduces. They learn too late that she is his sister. Ashamed, she drowns herself. Kullervo sets out to revenge himself on Untamo, and manages to do so. But when he returns home he discovers that all of his family is dead. He asks his sword if it is willing to drink his blood, and it speaks, saying that it is; and he falls on his sword. It is this part of the story that influenced Tolkien's story of the Children of Hurin; Turin Turambar's story shares all the tragic elements of Kullervo's. It is very noticeable that Turin's story is massively darker, and part of this is because Kullervo is so absurdly over-the-top of everything that there is a sort of dark comedy, at least at first, to the fact that he destroys everything around him. But there is no comic element to Turin's story. Unlike Kullervo, Tolkien gives us much of Turin's motivations, and this is, I think, the reason. The major difference between Kullervo and Turin is simply that Kullervo is practically born to tragedy; his life is the working out of the Fratricide with which it starts. He can hardly help himself, although the killing of the wife of Ilmarinen was a very cold-blooded thing to do. But Turin's tragedy all comes from his pride, and there is nothing comic about pride. (5) Ilmarinen, distraught over the death of his wife, tries to make a new one out of metal, but he finds this unsatisfactory for the obvious reasons. He then goes to Pohjola to get another of Louhi's daughters, but both Louhi and the daughter refuse. He returns and tells Väinämöinen about the Sampo, which is providing Pohjola with an inexhaustible source of wealth, and together they set out to steal it, soon joined by Lemminkäinen. In the course of their trip, Väinämöinen catches a pike and makes the first kantele of it, making extraordinary music. With this kantele he is able to enchant the whole of Pohjola, and they steal the Sampo. When the people of Pohjola awake, they are, of course, outraged, and Louhi raises obstacles against the thieves, leading to the loss of the pike kantele, and eventually attacks herself in the form of the monstrous eagle. A terrible battle follows, during which the Sampo is destroyed, and its pieces fall into the sea. Some of the pieces, however, wash up on the shores of Kalevala, bringing the people of Kalevala good luck. Väinämöinen manages to make a birch kantele to replace his pike kantele. Louhi attempts to destroy the prosperity of Kalevala by sending first plagues and then a bear. Väinämöinen is able to counter these. Finally she steals the sun and moon, which ends up being a much more troublesome problem. Väinämöinen and Ilmarinen try several different ways to get around this, and finally determine a complete assault to get the real sun and moon is the only way to solve the problem. Louhi gets wind of this and, knowing she is in no position to deal with such a thing, sets the sun and moon free. Is there anyone who can possibly think that "not in a month of Sundays" was a better translation here than "not in a gold-white moon," even if the latter required an endnote? There are plenty of examples of this sort of thing; for instance, in his search for synonyms for 'said', he repeatedly uses the word 'chattered' in contexts in which it makes no sense. But it is in the battle scene, in Runo 43, that I think we see the real limitations of Bosley's approach. To show this, here is someone singing parts of the battle scene in Finnish (to a modern melody, although one designed for the Kalevala), with John Martin Crawford's 1888 translation on the screen. but there was one talon left. and a thousand fellows from the tail. Bosley gives us an old guy beating a bird with an oar. Strictly speaking, there's a sense in which that is exactly what is happening, but this is in fact a clash of titans: Väinämöinen against Louhi; Louhi has come against the heroes with overwhelming power, and Väinämöinen rises to the occasion. This is a recurring fault in Bosley, and, actually, in most modern translators of narrative verse: consistent error on the side of the prosaic. But while narrative verse may be like prose in being narrative, it is not prose. (6) Finally, we get song 50, which is in a class by itself. A young woman named Marjatta, who is a virgin, eats a berry (marja) and becomes pregnant. She has to fend off accusations of being a whore, and when it comes time to give a birth, she needs to find a sauna, but nobody will let her use one. Finally, her little servant girl, Piltti, comes to the home of a man named Herod, and while they refuse to let Marjatta use the sauna, they do let her use the stable. There she gives birth to a baby boy. He vanishes and she finally finds him in the swamp, like an abandoned child. She then tries to get him christened, but no one will do it because they want an inquiry into who the father was. Väinämöinen tries to decide the case, but when he comes down on the wrong side, he is sharply scolded by the little boy for his sins, and is so ashamed that he leaves Kalevala, leaving behind only the kantele. Thus with the coming of the Son of Mary the age of Väinämöinen ends. I have previously talked a bit about Runo 50, so I won't do so here. Favorite Passage: There are lots to choose from, but the following is a good one. Lemminkäinen's mother has sent a bee to the house of God in order to get the last bit for her resurrection charm. Recommendation: This is one of those literary works everyone should read at least once in their lives. And despite my complaints about Bosley's weaknesses, his is in fact a good translation in many other ways, being swift and rich with parallelisms. All references to The Kalevala: An Epic Poem after Oral Tradition by Elias Lönnrot, Keith Bosley, tr. Oxford UP (New York: 1989). Kindle fires to warm it! Go, build houses in it! On the winds to din it? Smile, till rainbows span it! Clear of clouds to fan it. Blends with Hope's bright river. This comes from a discussion at the end of Book I of the Treatise, in which Hume gives the reasons why the skepticism he has come to is not crippling. THere is some dispute about how this should be understood. For my part, I know not what ought to be done in the present case. I can only observe what is commonly done; which is, that this difficulty is seldom or never thought of; and even where it has once been present to the mind, is quickly forgot, and leaves but a small impression behind it. Very refined reflections have little or no influence upon us; and yet we do not, and cannot establish it for a rule, that they ought not to have any influence; which implies a manifest contradiction. Here then I find myself absolutely and necessarily determined to live, and talk, and act like other people in the common affairs of life. Under what obligation do I lie of making such an abuse of time? And to what end can it serve either for the service of mankind, or for my own private interest? No: If I must be a fool, as all those who reason or believe any thing certainly are, my follies shall at least be natural and agreeable. Where I strive against my inclination, I shall have a good reason for my resistance; and will no more be led a wandering into such dreary solitudes, and rough passages, as I have hitherto met with. We cannot possibly have an obligation to waste our time in reasonings that by their very nature can never get anywhere, if we have no benefit, for ourselves or others, from engaging them; and what possible benefit could we expect to arise from abstract reasonings that put into question whether other minds exist or whether there is an external world? What use could such bizarrely remote philosophical questions be? All this, however, is a line of reasoning that is founded on being faced with that "philosophical melancholy and delirium". There are other moods, however, and when we are in a better mood, these philosophical reasonings are not such obvious bugbears. In a better mood, a skeptical philosopher like Hume will be willing to face life more skeptically, living life according to inclination but still preserving skepticism. And this is where Hume gives us the Title Principle. It's not a rule for reasoning. It's not even an answer to the problem of skepticism as such: it is description of a sentiment arising in philosophical psychology. Rather, I think, it is part of a larger line of reasoning for the idea that the problem of skepticism (how does a skeptic live a life) is not as practically important as it might seem. Our minds are not stuck in one mood all the time; and how seriously we can take such problems will depend on our moods. Club for Five, "Joka päivä ja joka ikinen yö". It's a love song, originally by Eppu Normaali (which you can also hear); the title means "Every day and every single night," and the chorus says "Every day and every single night I think of you; / Every day and every single night my heart beats." Today is the feast day of Bl. 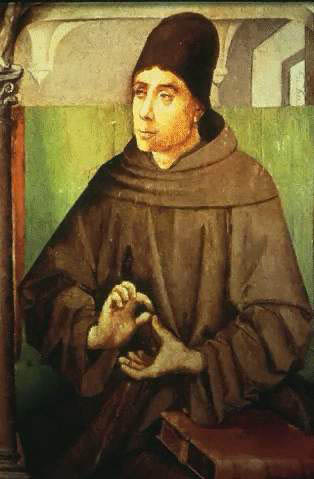 John Duns Scotus, the Subtle Doctor. One of Scotus's arguments (from the Questiones subtilissime Scoti in metaphysicam Aristotelis), as very roughly translated by me from some random version of the Latin I came across once (and thus the translation is to be taken with a grain of salt both on the textual side and on the translation side). The argument is actually quite simple in structure, since it is a parity argument, although one has to read the last few sentences closely. I find this is commonly true of Scotus; he is very difficult to read and interpret, but the logical structure of the arguments is generally very simple and elegant once you manage to win through to it. Anything active regards as its primary object such a passive thing, not this passive thing. For example, what in general is able to heat regards as its primary object what in general is heatable, not this or that particular one. Likewise from the other side, the passive, what is heatable (and this either in general or as any particular heatable), regards as its primary object what is able to heat, not this or that particular one, but in general. From this it follows that whatever is contained under the primary object of something is object, per se, of the same. Thus what is able to heat regards as its object, per se, what is heatable, and (from the other side) the heatable, whatever is able to heat. But it is possible for something to be active with respect to A in the same way that something else is active with respect to A, and for something to be passive with respect to A just as something else is passive with respect to A. Therefore it, as active, has itself, as passive, for an object just as it does anything else; therefore it is able to act on itself just as on another. Despite the common attempt to pretend that there are two and only two options on the table, every election year there are actually quite a few presidential candidates; people who are not enthusiastic Donkeys or Elephants generally vote as they do not for lack of options but out of electoral realpolitik. But this was a very good year for third-party candidates. The Libertarians, under Gary Johnson, had one of their best years ever: they hit over a million ballots and at one percent of all ballots cast they were just short of their 1.1 percent high in 1980; if they could get just one Electoral College vote (which they've done once, in 1972 under philosopher John Hospers), they would hit the Third Party Trifecta. The national numbers don't mean much, except as a measure of participation, but Johnson caught over 3% of the actual vote in New Mexico, nearly 3% of the vote in Montana, about 2.5% of the vote in Alaska. Jill Stein, of the Green Party, came in fourth, with about 0.3% of the ballots cast, with something like 400,000 total; she got 1.3% of the vote in Maine, about 1% of the vote in Alaska, and about 1% of the vote in Oregon. And she did it having been arrested at least three times during her political campaign (for various sorts of protests); I'm not sure if this is a record, but it's bound to be pretty close. Even Rosanne Barr and Cindy Sheehan managed to get almost 50,000 people to vote for their Peace & Freedom Party ticket. Here's a list of all the Presidential candidates who had some kind of ballot or write-in status in the 2012 election. For the first time, Puerto Ricans have voted for statehood. This does not, of course, mean that the process of statehood for Puerto Rico has started: the referendum was nonbinding, that would require official action by both the Puerto Rican government and Congress, and there are obviously a lot of things that would have to be done even to gear up to something like that. But assuming this isn't a statistical fluke, and isn't due to people being confused about the questions, this is a notable shift, one that might eventually result in a definite difference in the political landscape. Puerto Ricans are already U.S. citizens, but since Puerto Rico is a territory rather than a state, it has no Electoral College votes and only nonvoting representation in Congress. Of course, the big question is how in the world we're going to get fifty-one stars in the blue of Old Glory without making the flag look odd. It's already a very star-spangled banner. Here are two suggestions; the first is minimal change -- with all the stars that are already there, it's hardly noticeable -- and the second a bolder change. I like the circular star pattern, but I don't know if people in general would actually go for it. So it looks like we may have elected the very Republican-like Democrat instead of the very Democrat-like Republican; we'll have four years of continued Democrat-like expansion of Presidential power rather than four years of new Republican-like expansion of Presidential power. Now that nothing's changed we can see if President Obama will actually get around to that Change thing we kept hearing about. Of course, officially the President hasn't actually been elected yet: the actual Presidential election is the Monday after the second Wednesday in December, and that in turn has to be given a certified count by Congress in January. Election Day is the beginning of the official constitutional process, not the end. But since states tie their choice of Electors to party performance in the state popular vote, the numbers are more or less set, allowing for occasional deviations of Electors. I was interested to see how busy the polling place was; last time it had been pretty quiet, but there was quite a line. Some people in line remarked the same thing. And when I left, the line was even longer than when I had arrived. One of the nice things about voting is that the mere fact of doing it is to some extent an act of good will towards, and solidarity with, one's fellow citizens, a recognition of equality in and of itself. It's easy, in all of the party politics, to forget that the good that fundamentally matters is the good common to everyone, the good we all have by virtue of being citizens. One can deplore all one wants the follies of one's fellow voters -- but absolutely one thing that should never be done is to look down one's nose at the fact of their voting. People tend to look at snake-handling as an irrational activity; which I've always found interesting, since most people do it every election. Like snake-handlers they believe that the pure of heart can handle snakes without being harmed; like snake-handlers, being bitten doesn't prevent them from going back. It is, of course, Election Day tomorrow in the U.S., so Americans gear up for the triumphant climax of our current snake-handling experience, in which we finally manage to vote for snakes who will not bite us, and carry scorpions across the stream without being stung. There are excellent arguments for voting, of course, but it is worth remembering that in total consequences it is probably one of the most dangerous activities you engage in all year. It can make a considerable difference which imperialistic warmonger you vote for; for instance, we might get involved in two or three wars next term instead of only one, and the rate at which American citizens are put on an assassination list on nothing more than the decision of the President might accelerate or decelerate. And, of extraordinary and crucial importance, it may make a considerable difference as to what purely symbolic gestures we offer up to economic gods. Yes, I am increasingly cynical when it comes to people telling me that their preferred candidate is worth voting for. Current betting on the outcome seems to be leaning toward Obama. I find myself somewhat skeptical; I think an incumbent who has been struggling as much as Obama has is not likely to sway independent voters. Conceivably this could be neutralized if the Democrats manage to get enough voters to the polls -- which is as much about logistics as about enthusiasm -- and people do seem to be saying that the Democrats are doing better than usual at such organizing this year, particularly in states like Ohio. But because Democrats have to negotiate very diverse demographics, the electoral equivalent of cat herding, Presidential elections in the U.S. are typically decided by two and only two things: how intensely interested in voting solidly Republican voters are, and which way independent voters swing. My suspicion is that Romney will reach 270 electoral college votes; an incumbent without incumbent advantage is a duck in the hunter's sights. Of course, a real answer to the question would require greater understanding of the causes of voting behavior than I have. It turns out that many of my students know what Guy Fawkes Day is, which is heartening. They know it, of course, because of the movie V for Vendetta. The following, if Wikipedia is to be believed, is the earliest recorded Guy Fawkes Day rhyme. British ambivalence about Guy Fawkes is always interesting: in the nineteenth century they burned him in effigy and eagerly read stories in which he was a hero, albeit a flawed one. William Harrison Ainsworth's Guy Fawkes is actually quite good; it takes his actions as wrong but nonetheless regards Fawkes very sympathetically. So the following chapters have been done at Tanaver. I think I'll keep trying for about one half-chapter a day, which shouldn't interfere with other things I need to do. The current wordcount is around 7650. As a sort of 'special feature', I thought I'd give my current draft of the poem from the Sylevid mentioned in Chapter II, the Amenetaar. to speak of kith and kin with bright voice. shall song be sung without the sun's flame? the singer will make with stories old. Though ice grow thick, joy will leap in hearts. the holiday-tale our fathers told! Sing with me in bright voice of old days. let apple bloom with sweetness and song! its boughs were heavy with ripe apples. The apples were sweet, their scent was joy. rich with every soul's habitation. One fruit was finest, full of sweet life. stout in her heart, a soul to endure. first in small journeys, then in long ones. The Coptic Orthodox Church has recently named its new patriarch, Pope Tawadros II, to replace Pope Shenouda III, who died in March. He will officially be recognized on November 18. The Coptic Patriarchs are, interestingly enough, chosen by lottery from a slate of candidates. Pope Tawadros has some big shoes to fill and comes to serve as the Patriarch of the See of Mark at an especially difficult juncture. The Coptic Orthodox Church is the largest Christian body in Egypt; about 10% of the Egyptian population is Coptic Orthodox. I reply that it should be said that matrimony, from the intention of nature, is ordered to the education of the children, not for a certain time only, but rather for the entire life of the children (which is the reason why, by the law of nature, parents are to lay up wealth for their children, and children should inherit from their parents). For that reason, since children are a common good of husband and wife, it is necessary according to the dictum of the law of nature that that association remain perpetually undivided. Thus, the inseparability of matrimony is based on the law of nature.—Super Sent., lib. 4 d. 33 q. 2 a. 1 co. This puts a somewhat different twist on the phrase 'educating children'; Aquinas sees it not as (merely) teaching little tykes, but as a much larger project of making sure the next generation has the counsel and resources they need throughout their lives. Education of one's children takes different forms, sometimes very different forms, depending on the age of one's children and the stage of one's own life, but it is a responsibility as enduring as the parent-child bond itself. In a sense it is even more so: by foresight we can guide and provide for others long after we are gone, laying up wealth both by teaching and by material inheritance.